Global alliance of overseas Filipinos Migrante International extends its most heartfelt condolences to the family of Kristel Pasadas, the 27-year-old Yolanda aid worker who died in Tacloban shortly after Pope Francis finished his celebrating his mass. “We especially deeply sympathize with her mother who is an overseas Filipino worker (OFW) in Hong Kong. Their family’s is a story of every Filipino migrant family; the tragedy of being forcibly separated from your loved ones out of necessity and desperation and being far away from them in times of hunger, crisis and calamity, and even death,” said Garry Martinez, Migrante International chairperson. “We can only imagine how her mother must feel. She must have felt so helpless when her family had barely survived supertyphoon Yolanda and now this heartbreak. To Kristel’s mother, may you take comfort in our collective mourning. 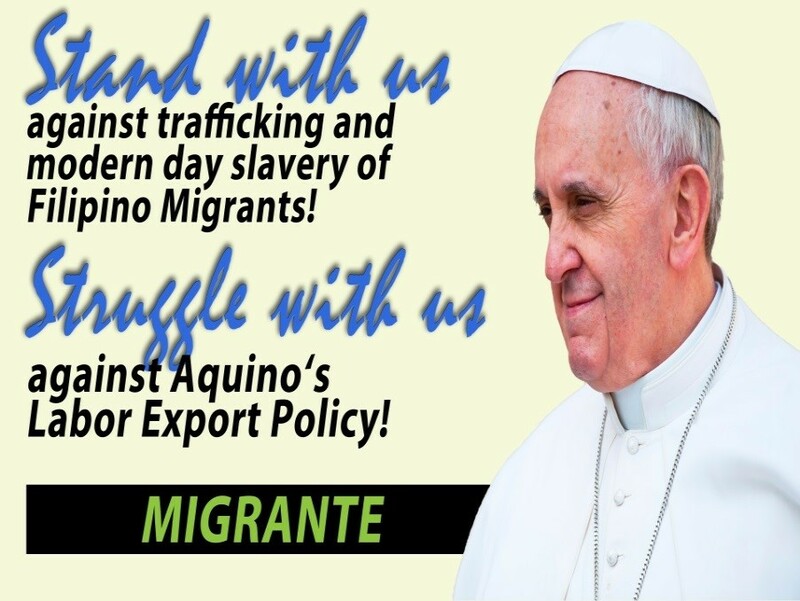 OFWs around the world feel your loss as we continue to fight against the government’s labor export policy that separates us from our loved ones and, as Pope Francis said, destroys families,” he said. Martinez said that tragic fate of the young Yolanda aid worker also reminded him of “another Kristel”. “The Pope asked us to pray in silence for Kristel, and we call on him to also pray for justice and call on the public to never forget another Kristel – Kristel Tejada who was driven to take her own life out of despair and hopelessness,” he said. Tejada was a 16-year-old student of the University of the Philippines who committed suicide in 2013 because her low-income parents could not afford the high cost of tuition in the university. During the time, UP tuition increased from P300 to P1,500 per unit. This entry was posted in News and tagged Kristel Pasadas, labor export policy, Migrante International, noynoy aquino, OFW, Pope Francis, Yolanda. Bookmark the permalink.